Huawei Mate 20 Pro latest smartphone is now available on Amazon website at Rs. 69,990. This smartphone is pretty good and gives unique premium look with curved display. It is an upcoming single nano sim or hybrid dual sim smartphone. Huawei Mate 20 Pro is powered by Kirin 980 octa core processor with 6GB LPDDR4x RAM, 128GB storage. You can expanded storage space up to 256GB via a microSD card. Huawei Mate 20 Pro smartphone priced in India Rs. 69,990. The Huawei Mate 20 Pro smartphone comes with 6.39 inch screen size with 1440×3120 pixels resolution. This smartphone is powered by Hi-silicon Kirin 980 Octa-core processor, paired with Mali-G76 MP10 GPU. This smartphone comes in two variants 256/8 GB, 128/6 GB RAM internal storage memory. You can easily expanded storage space up to 256GB with the help of microSD card. Huawei Mate 20 Pro smartphone is running on Android 9.0 pie operating system. This smartphone comes with 4200mAh non removable Li-Ion battery. If we talk about the camera quality, this smartphone comes with 40-megapixel (f/1.8) primary camera and a 20-megapixel (f/2.2) secondary camera on the rear and a 24-megapixel front shooter for selfies. This smartphone comes with Leica optics, dual-LED dual-tone flash, panorama, HDR. You can also get Face ID, fingerprint sensor, accelerometer, gyro, proximity, barometer and compass. The dimension of this smartphone measured in 157.8×72.3×8.6mm with 189g weight. The Huawei Mate 20 Pro comes with Single SIM (Nano-SIM) or Hybrid Dual SIM (Nano-SIM, dual stand-by). Connectivity options include Dual Speakers main speaker is within the USB Type C port. You can also get Wi-Fi 802.11, dual-band, Wi-Fi Direct, hotspot, Bluetooth 5.0, dual-band A-GPS, GLONASS, BDS, GALILEO, QZSS, NFC, 3.1, Type-C 1.0 reversible connector, USB On-The-Go. This smartphone have Face ID, fingerprint, accelerometer, gyro, proximity, barometer and compass feature. Huawei Mate 20 Pro smartphone supports Volte/4G/3G/2G on compatible networks. This smartphone is available in five colors like Emerald Green, Midnight Blue, Twilight, Pink Gold and Black. It comes with 4200mAh non removable Li-Po battery with fastest charging feature. Processor HiSilicon Kirin 980 octa core processor with Mali-G76 MP10 GPU, Android 9.0 (Pie) O.S. Memory Available in two variants 128+6 GB, 256+8 GB RAM internal storage memory. Expandable up to 256GB via microSD. Display 6.39″ AMOLED capacitive touchscreen, 16M colors. 1440 x 3120 pixels resolution, Corning Gorilla Glass with Android 9.0 Pie, Android One. Dimensions Height:157.8 mm, Width: 72.3 mm, Thickness: 8.6 mm, Weight: 189 g.
Camera Camera, this smartphone comes with triple camera 40 MP, f/1.8.20 MP, f/2.2 and 8 MP, f/2.4 with Leica optics, dual-LED dual-tone flash, panorama, HDR. Battery 4200mAh with fast charging. Connectivity Single SIM (Nano-SIM) or Hybrid Dual SIM (Nano-SIM, dual stand-by)IP68 dust/water resistant. Dual Speakers main speaker is within the USB Type C. Support Wi-Fi 802.11 a/b/g/n/ac, dual-band, DLNA, Wi-Fi Direct, hotspot, Bluetooth 5.0. This smartphone comes with dual-band A-GPS, GLONASS, BDS, GALILEO, QZSS, NFC, 3.1, Type-C 1.0 reversible connector, USB On-The-Go. Price & Color Priced above Rs.69,990. Color: Emerald Green, Midnight Blue, Twilight, Pink Gold and Black. This is a premium and good looking smartphone, which comes with triple camera feature. 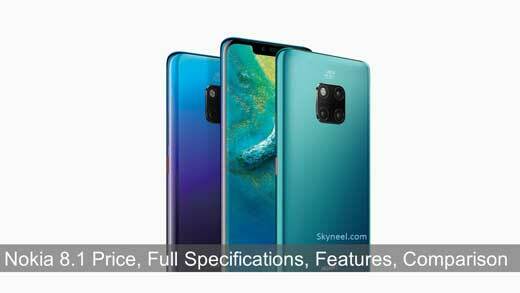 If you planned to buy high ranged smartphone then Huawei Mate 20 Pro is better option for you.